Italdesign Chairman Giorgetto Giugiaro: "In the future, we will work exclusively for the VW Group." TURIN – Italdesign Giugiaro S.p.A.'s current customers will have a choice of staying with the company or shifting their business elsewhere now that Volkwagen AG controls Italy's largest automotive design and engineering company. Italdesign counts Germany's BMW AG, Malaysia's Proton and U.S.-based Hybrid Kinetic Motors Corp. among its clients. Automakers might be nervous that VW will gain access to their confidential technology through Italdesign but Chairman Giorgetto Giugiaro dismissed such worries. “In the future, we will work exclusively for the VW Group as they have enough brands to utilize all our resources,” Giugiaro said when announcing the deal in which VW will take a 90 percent stake in his company. “We are ready to complete all the projects we are working on [for other automakers] and we will guarantee 100 percent secrecy. It is up to our clients to decide if they want to continue,” he added. A BMW spokesman said Tuesday that the automaker would continue with its contract with Italdesign, which is providing the engineering for BMW-owned Mini's Roadster and Coupe models. Enzo Pacella, Italdesign CEO, said Tuesday that the company has about another year of work to do on the Mini derivatives. Representatives from Proton and Hybrid Kinetic Motors could not be reached for comment. Italdesign signed a 375 million euro ($462 million) multi-year deal in January to provide complete design and engineering for eight new models for Hybrid Kinetic Motors. Italdesign also has a contract with Proton to develop the production version of the roomy Emas minicar concept that was unveiled at the Geneva show in March. Other Italdesign customers that could be affected by the VW deal include China's Brilliance China Automotive and Chery Automobile. Both compete again VW's joint venture partners in China, FAW Group Corp. and Shanghai Automotive Industry Corp.
VW CEO Martin Winterkorn said Tuesday that Europe's largest automaker has had a so-called “comprehensive development framework agreement” with Italdesign since 2008. Winterkorn said that Italdesign engineered the second-generation VW New Beetle hatchback and cabriolet as part of that agreement. Italdesign's styling work is often made public by its automaker clients, but its engineering projects typically remains confidential because automakers don't like it when credit for such a crucial part of their models is given to an outside company. In the past five years, the only engineering job that Italdesign has been allowed to take credit for is its work on the second-generation Mini range, which currently includes a hatchback, convertible and the Clubman station wagon. VW's takeover of Italdesign is part of VW's plan to be the world's largest automaker by 2018 with sales of 10 million vehicles a year. To reach that goal, VW's 10-brand group, including Porsche, will need more designers and engineers. In 2010 alone, VW group plans to add 60 models, including upgrades. 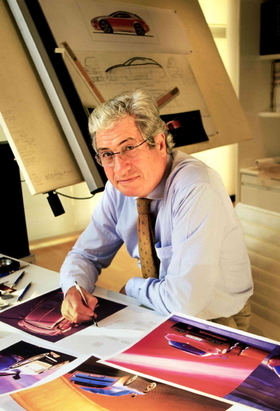 Italdesign, co-founded by Giorgetto Giugiaro in 1968, currently has 800 employees and 800 computer aided design workstations. Most of the workers and equipment are based at the company's headquarters in Moncalieri, 15km south of Turin. Italdesign is a private company entirely owned by Giorgetto Giugiaro, 71, and his son Fabrizio, 45, who heads the design and model division. They will hold a combined 10 percent stake in the new company. Both executives as well as Italdesign CEO Pacella will be on Italdesign's new seven-member board. Other board members will include VW CEO Winterkorn, Audi CEO Rupert Stadler and two yet-to-be-named VW Group executives.